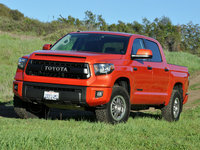 CarGurus has 50,572 nationwide Tacoma listings starting at $3,200. From a technological standpoint, this truck definitely shows its age. But if you’re the type of person who will really put the Tacoma TRD Pro through its paces, maybe you’re actually living life instead of just reading tweets about it. Now in its final year of production before a complete redesign, the 2015 Toyota Tacoma is available as a limited-production TRD Pro trim that enhances its off-road capability in a Baja-flavored way. This one-trick pony may not serve as a versatile family vehicle, but it offers undeniable talent to those people whose destinations lie way off the beaten path. There I am, cresting the dunes of Baja with all 4 tires detached from the ground, catching major air and landing with a thud, but knowing the Toyota Tacoma TRD Pro will get me to the finish line, where I’ll be crowned champion of this year’s brutal race. That’s what’s running through my mind, anyway. In reality I’m tooling up the hill to my daughter’s elementary school, a street marked by several pretty intense speed bumps and watched over by a cranky crossing guard who gives you the stink eye if you’re going even a couple of miles per hour over the prescribed limit. With that, I’ll start this review by admitting that I didn’t put this performance-oriented Tacoma TRD Pro through its intended paces. Except for traversing a drainage ditch to access a tight but relatively tame mountain trail, this Inferno Orange Taco performed family duty in the ‘burbs, drawing a spectacular amount of attention along the way. That’s a shame, really, as Toyota has worked hard to make this version of its ancient midsize pickup truck as desirable as possible. 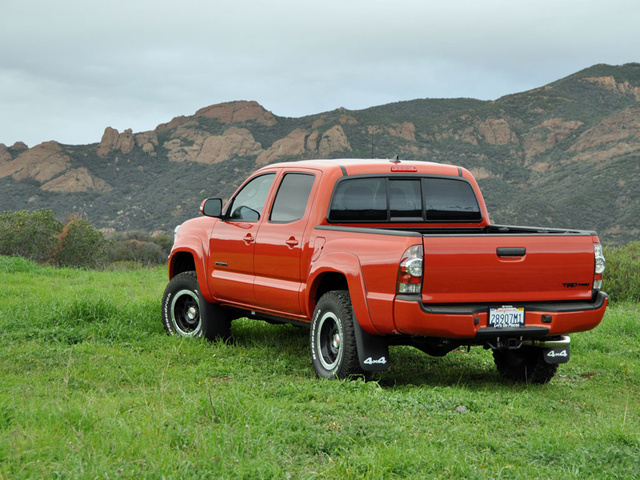 Now 10 years old in its current form, this iteration of the Tacoma will be replaced in the fall by a completely redesigned 2016 Tacoma that will better compete with the all-new Chevy Colorado and GMC Canyon. These three models, plus the hoary old Nissan Frontier, are the four remaining midsize trucks in a world dominated by gleaming, full-size beasts. Cheekily known as the Taco Supreme, my Tacoma TRD Pro Double Cab test truck bristled with off-roading hardware, including an electronically locking rear differential, hill-start assist control, downhill assist control, and 16-inch bead-lock-style aluminum wheels wrapped in knobby BFGoodrich all-terrain tires. The TRD Pro’s main upgrade, though, is the suspension. Red Eibach springs with softer spring rates peep out saucily from the wheel wells, and the TRD Pro is equipped with Bilstein shocks with remote reservoirs. Wheel travel is increased 1.5 inches up front and by 1 inch in back, and the front suspension sits 1.75 inches higher for a proper Baja-style stance. Additionally, my test vehicle had a TRD supercharger ($4,720 for a kit) and a throaty TRD cat-back exhaust system ($390 for the part), each of which pump up power output to an impressive degree. With all these extras, plus an automatic transmission, a tow package, and a set of floor mats, my test truck’s sticker price climbed to an almost unbelievable $44,390 including the $885 destination charge, but not installation for the supercharger and exhaust system. 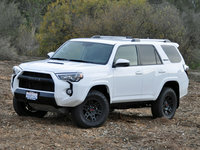 Appearance-wise, the Tacoma TRD Pro sports a unique matte-black grille with FJ40-inspired TOYOTA lettering and TRD-badged interior bits inside the cabin. It rides noticeably higher than a stock Tacoma, and it has no step rails to ease entry. My husband thought this truck looked terrific, as did a number of other people who craned their necks to get a better look as I motored by, but an off-road-ready rig painted a glowing orange hue isn’t really my thing. If you’re not an extrovert, you can get a Taco Supreme in black or white, too. Inside, it's clear that all the money the TRD Pro commands has gone into hardware and not upgrades in terms of materials and sophistication. Generally, I like the layout here, but the acres of relentlessly cheap and gray plastic are, at best, easy to clean following a 4-wheeled mud run. No one buys a pickup truck seeking athleticism when rounding canyon corners or a comfortable ride quality around town, and the Tacoma TRD Pro is no exception despite its appealingly modified suspension. The steering is numb; the brakes, while effective, are clumsily modulated; the high center of gravity limits enthusiasm when changing direction; and my test truck’s optional TRD supercharger proved to be a constantly whining companion. Speaking of that supercharger, it pumps the 4.0-liter V6 engine’s horsepower rating from 236 to 295, while torque increases to 318 lb-ft from 266. The effect on acceleration is instantly noticeable, but Toyota doesn’t report how this addition to the engine impacts the truck’s 6,400-pound maximum tow rating. While the supercharger might be noisy, it turns a Tacoma into a relative rocket ship, and on slick pavement you’ve gotta be especially careful of slamming down on the gas lest you suffer unintended tail-out oversteer. Mostly because of its supercharged engine, I found my Tacoma TRD Pro enjoyable to drive, and while I found the non-stop whine and added exhaust grumble a bit overbearing, my daughter thought the racket made the truck sound like a racecar. Of course, you pay for the extra power at the gas pump. I averaged just 15.1 mpg during a week of driving. Clearly, this is a thirsty pickup. As much as I marveled at how the suspension modifications improved the Tacoma’s ride quality on pavement, the TRD Pro is designed to shine off-road. Though I could not drive it in a proper environment, the upgrades are collectively intended to allow this version of the Tacoma to glide across moguls and gullies like nobody’s business. On the trail I took, the Tacoma’s relatively tidy width allowed the truck to squeeze through thickets of thorny bushes, effectively going places the sumo-wrestler-size Toyota Tundra TRD Pro definitely could not. Twist a knob on the dashboard to activate the 4WD system and then go splashing through some mud. This version of the Tacoma will love you for it. As entertaining as it might be, choosing a purpose-built pickup truck like this one represents as much of a compromise in daily driving as a sports car does. Unless you’re planning to spend plenty of time exploring a Tacoma TRD Pro’s prodigious talents, it can get tiring to drive in very short order. 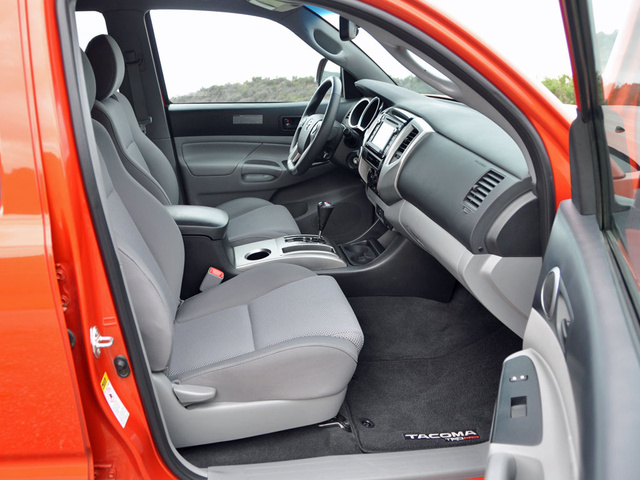 Unlike many modern pickup trucks, you won’t mistake the cabin of this $40,000 Tacoma for a luxury SUV's. There’s nothing that could be described as premium in there, and everything is covered in hard, gray plastic that’s designed more for durability than to deliver any hint of aesthetics. 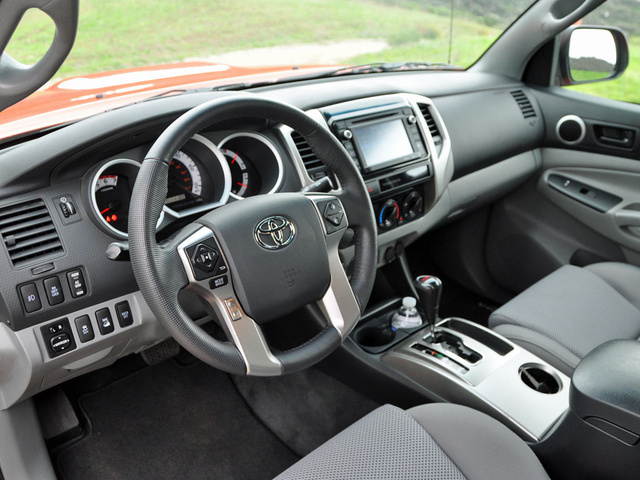 Overall, the Tacoma’s controls are straightforward and easy to use, with big buttons and knobs controlling most of the functions. Toyota supplies numerous bins and trays, too, and the rear-seat cushion flips up to accommodate taller and wet or dirty items. Locking storage bins are also located under there. Comfort levels are decent, but no better. The driver’s seat sits low and flat, offering no height adjustment. Since the Tacoma TRD Pro sits so high, this doesn’t matter much. In fact, it might even make entry and exit easier. However, this version’s slight front suspension lift and bulging hood scoop do make a driver wish for a couple of additional inches of seat elevation for a better view over the hood. Big side mirrors help eliminate blind spots. My Double Cab model’s rear seats were unexpectedly comfortable. While legroom is snug, the firm seat cushion positions occupants high and supplies good thigh support, and there’s a decent amount of foot room. 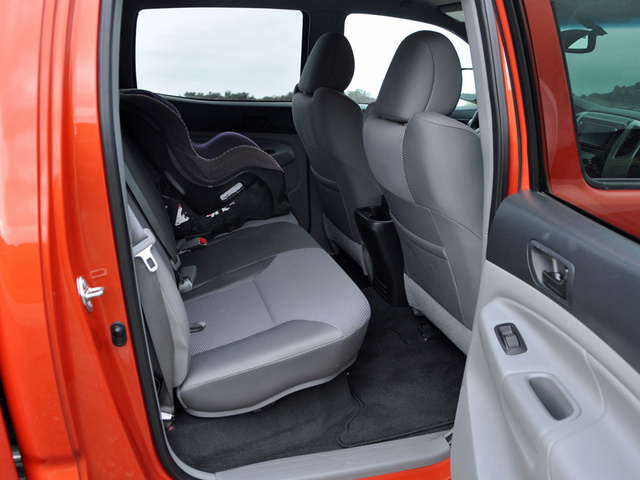 Softly padded front seatbacks improve knee and shin comfort, too. The whole point of a pickup truck is that you can carry big bulky items in the open cargo bed, making you a popular person when friends, acquaintances, and the friends and acquaintances of those people need help on moving day. For day-to-day errand running, especially when you’re toting around a couple of kids, a pickup truck’s bed isn’t the most practical tool in the world. You can’t carry grocery bags back there, whatever is carried in the bed is subject to the caprices of weather, and when making multiple stops nothing is secure from theft. Then again, it's likely that most Tacoma TRD Pro owners might plan to carry little more than surfboards, mountain bikes, and camping equipment, especially since a Tacoma Double Cab’s relatively small cargo bed is just 5 feet long and about a foot-and-a-half deep. You can, however, load the truck with up to 1,305 pounds of payload. No surprise here, but the Tacoma’s level of technological sophistication pretty much stops with the 6.1-inch touchscreen infotainment system. Standard for all versions of the truck, the basic setup includes a fast-charging USB 2.0 port and Bluetooth pairing and music-streaming capability. My TRD Pro test truck gets the premium version of this technology as standard equipment, which adds Entune App Suite smartphone integration, a reversing camera, a navigation system, and a JBL premium sound system. Additional highlights include advanced voice-recognition technology, satellite radio, predictive traffic and weather reports, and HD Radio reception. More evidence that the Tacoma is ancient can be found on the safety front, and in the form of a Toyota website that calls out the truck’s 6 standard airbags as a selling point. Aside from Smart Stop Technology designed to prevent instances of unintended acceleration, an optional reversing camera, and my test truck’s downhill assistance control system that limits speed on harrowing hillside trails, you are on your own. Structurally, the Tacoma doesn’t get the job done, either. The truck gets a 4-star overall rating from NHTSA, but protection for the front passenger in a frontal-impact collision rates just 3 stars. Surprisingly, the 4WD Double Cab earns a 4-star rollover resistance rating, but that’s for the standard model, not the lifted TRD Pro version. In crash tests conducted by the Insurance Institute for Highway Safety, the Tacoma gets Good ratings but hasn’t been tested for protection in a small overlap frontal-impact collision. Don’t roll one, as the roof crush strength rating is Marginal. 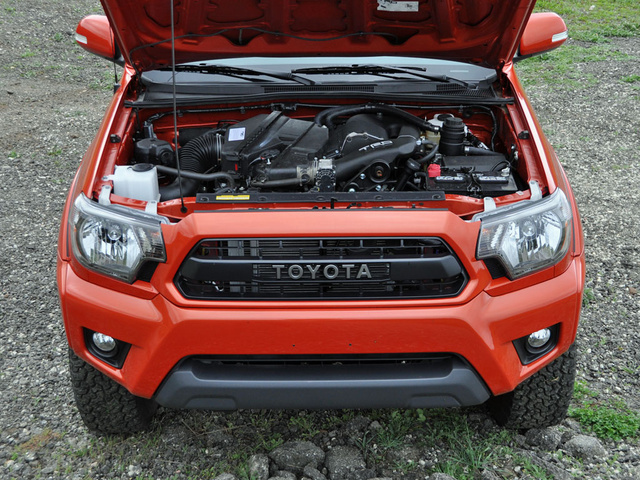 Let’s cut to the chase and judge the Tacoma TRD Pro with a supercharged engine as cost-ineffective. From the price tag, both for the truck and the supercharger, to the lousy fuel economy, it’s just not cheap to buy or own something like my test truck. Get a “normal” Tacoma and the picture improves. Getting 18 mpg from a 4.0-liter V6 simply isn’t very impressive in a world where full-size pickups can do that or better with a V8 engine, but in terms of reliability and dependability, a Tacoma is a durable machine according to Consumer Reports and J.D. Power. Additionally, Toyota dealers are willing to slice and dice the price in order to make sure you drive one home, and ALG says a Tacoma will retain a big, fat chunk of its value over time. Yes, this is an old truck. Yes, a new one is coming. But getting a Toyota Tacoma still makes good financial sense, especially if you’re planning to beat it up. 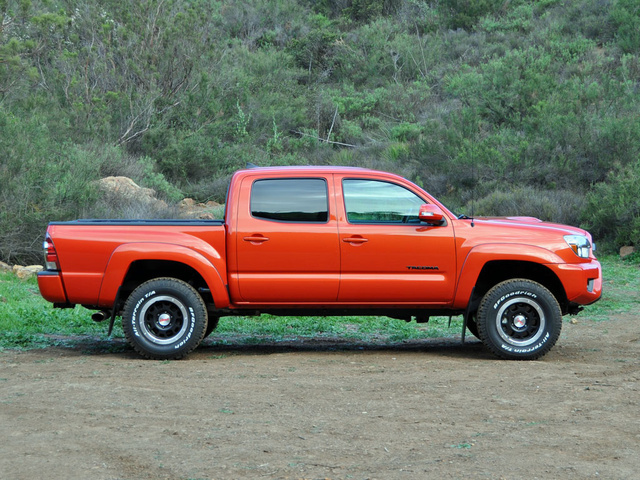 What's your take on the 2015 Toyota Tacoma? 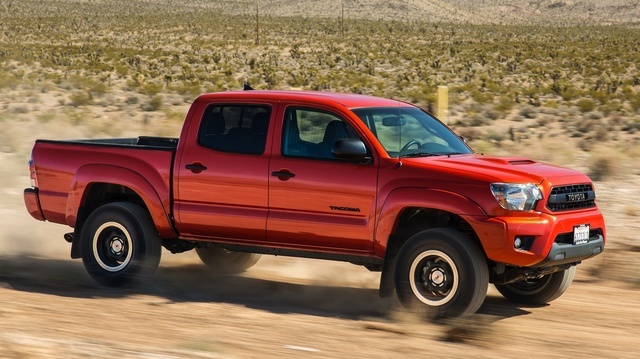 Users ranked 2015 Toyota Tacoma against other cars which they drove/owned. Each ranking was based on 9 categories. Here is the summary of top rankings. 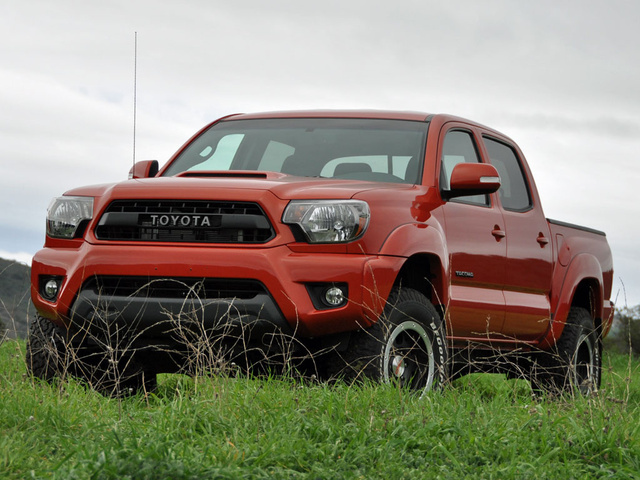 Have you driven a 2015 Toyota Tacoma? where is the fuse box located on a 2015 toyota tacoma?